Online resources designed to help instructors plan and teach their courses (www.routledge.com/9780415315746). Excellent. A concise, ‘task analytic’ presentation of the complex steps necessary in writing literature reviews. This is an excellent text for teaching both reading research literature and writing literature reviews. A wonderful step-by-step guide to the writing process. 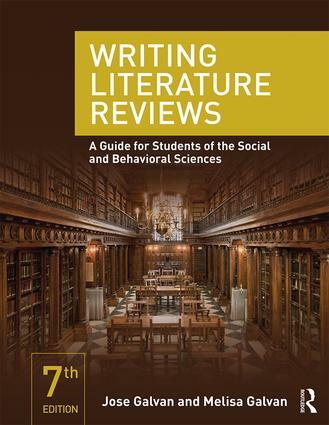 This book has an invaluable checklist for students who are writing literature reviews. Literature reviews are high stressors for even the most accomplished students. This text greatly alleviates their anxiety with clarity, organization, examples, and easy-to-understand ‘How to’ tips. I won’t teach research without it! Exceptional book—the only one in the field that actually helps students do the review and succeed at it. This text is a masterpiece, carefully and thoughtfully crafted for both undergraduate and graduate students. Jose L. Galvan (Ph.D., 1980, UT Austin) is Professor Emeritus at California State University, Los Angeles. His academic career spans 39 years, including appointments at UCLA; Teachers College, Columbia University; California State University, Los Angeles; and San Francisco State University. Melisa C. Galvan (Ph.D., 2013, UC Berkeley) is Assistant Professor at California State University, Northridge.